A Sender Policy Framework (SPF) record is a type of Domain Name Service (DNS) TXT record that identifies which mail servers are permitted to send email on behalf of your domain. The purpose of an SPF record is to detect and prevent spammers from sending messages with forged From addresses on your domain. Note: If your domain is registered at another company, see the Domains registered at another company section below for instructions. Looks like you're not logged in. If you log in above (under ), we can save you a couple of steps. On the DNS Management page, at the bottom of the Records section, click Add and select TXT from the menu. Host - Enter the host name for the TXT record. For example, type @ to map the record directly to your domain name, or enter the subdomain of your host name (labeled Host), such as www or ftp. TXT Value - Enter the value you want to assign to the record. Note: For a TXT SPF record, enter the SPF rule in the TXT Value field. For example, enter v=spf1 mx -all to indicate that all email is sent from this server and no other mail servers are authorized. Get more guidance on how to create SPF record rules. Select how long the server should cache the information. This is called TTL (Time to Live). 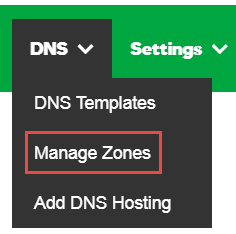 Go to the DNS Management page. Note: You can create multiple TXT SPF records, but their cumulative lengths cannot exceed 512 characters. Enter the domain name you want to use and click Search. Tak for din feedback. Benyt telefonnummeret til support eller chat-funktionen ovenfor, hvis du vil tale med en kundeservicerepræsentant. Det glæder os, at vi kunne hjælpe! Er der andet, vi kan gøre for dig? Beklager. Fortæl os, hvad du fandt forvirrende, eller hvorfor løsningen ikke løste dit problem.